Fortuna Hostel i Vilnius, Litauen: Bestill nå! Welcome to Vilnius and welcome to Fortuna Hostel! Whether you arrive by bus or train, you have less than a ten minute walk from where we will be waiting for you. From the hostel to the beautiful Dawn Gate (Old Town Gates) is a short walk. 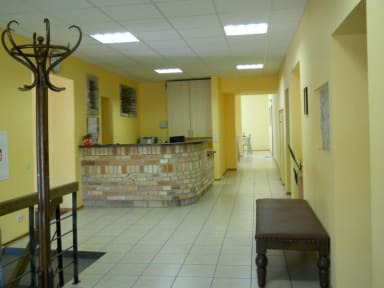 We have private rooms as well as dormitories. Come solo or as a couple or part of a group and you will be welcome. You can prepare your own meals for yourself or with new friends you have just met. Sit on the balcony sipping free tea or coffee while watching the trains roll by in front of you. After a great day of exploring Vilnius, hang out here and play cards, chess, checkers, and backgammon.